Special Report: Penang manufacturing ready for Industry 4.0? This article first appeared in The Edge Malaysia Weekly, on October 2, 2017 - October 08, 2017. 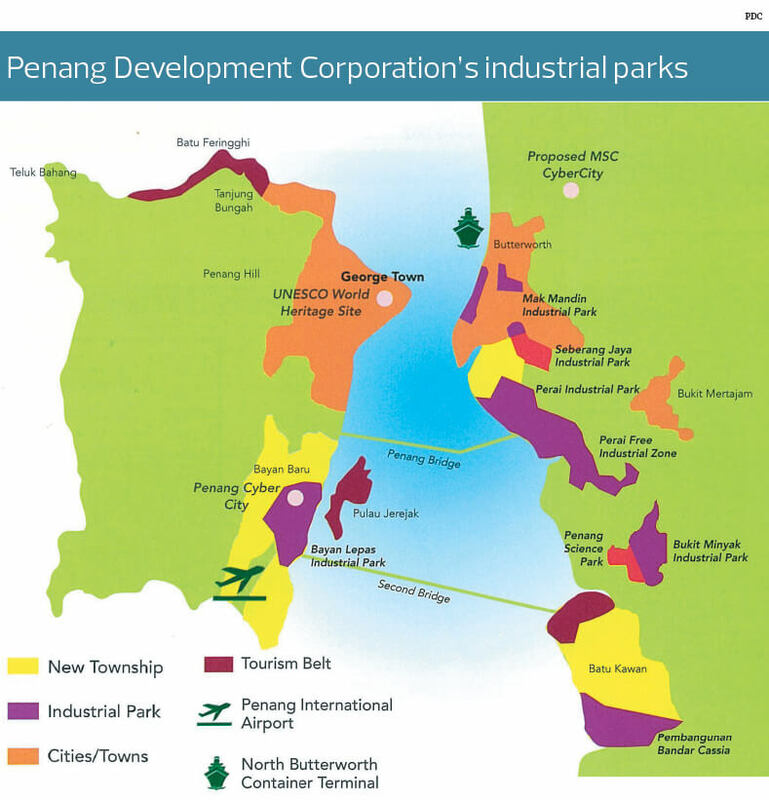 FOR nearly five decades, the manufacturing sector has been Penang’s economic backbone, making up 44.7% of its commercial activity in 2015 after the colonial-era free-port status was removed in 1969 by the federal government. Backed by the state’s second chief minister Tun Dr Lim Chong Eu’s vision in the 1970s to turn a mostly agriculture-based Bayan Lepas into a sprawling industrial hub, Penang island soon became known as the country’s Silicon Valley. It also became an electronic and electrical (E&E) powerhouse supported by multinational corporations (MNCs) such as Intel Corp, Osram Licht AG, B Braun Melsungen AG, Robert Bosch GmbH, Agilent Technologies Inc, Jabil Inc and Dell Inc.
Penang contributed 12.8% to the country’s manufacturing revenue of RM244.2 billion in 2015, after Selangor at 28.9%. Several small and medium enterprises (SMEs) that started off as tier three and four suppliers to the suppliers of MNCs in the 1970s onwards mostly grew with the global giants, earning their stripes to become large local companies (LLCs). Today, there are more than 3,000 SMEs supporting the MNCs and LLCs in the supply chain ecosystem. Most of them are semiconductor producers involved in the back end, from outsourced assembly and testing to manufacturing integrated circuit (IC) parts, printed circuit boards, sensors and precision tools. However, Penang-based players do not seem keen to move up the value chain to become front-end manufacturers, such as wafer fabrication or IC design, because of the huge investment costs and lack of expertise. The E&E national key economic area aims to enhance IC support areas such as talent, intellectual property protection and acquisition, electronic design acquisition and project design kit (design library). This is targeted to increase the number of IC design firms in Malaysia to at least 50 (local and multinational) by 2020 that can help generate a gross national income of RM3.17 billion and 2,000 jobs, according to the Economic Transformation Programme. Apart from the almost impossible task of shifting to front-end manufacturing, there is also the onslaught of Industry 4.0, the digitalisation of manufacturing, where a number of Penang manufacturers are slow on the uptake. Industry 4.0 was introduced in line with Germany’s numerous Meister (craftsman) programmes and vocational and academic systems to overcome the problem of skilled labour shortage and rising wages. It is similar to America’s smart manufacturing concept where factories are fully automated, requiring only a few workers to run the plant, says Invest-in-Penang Bhd general manager Datuk Loo Lee Lian. She notes that there are nine pillars of technological advancement to Industry 4.0 — autonomous robot, big data analytics, supply chain, cloud, Industrial Internet of Things, additive manufacturing, horizontal and vertical integration, simulation and augmented reality, and cybersecurity. Since last year, the Ministry of International Trade and Industry has urged local players to embrace the future of manufacturing, driven by the digital revolution and the Internet of Things, in line with global modernisation. The ministry envisions Malaysia to have embraced Industry 4.0 in 2050 and acknowledges that for a start, many SMEs find the move a daunting task as they are unsure where to begin, it says in a May statement. SEMI, the global industry association for semiconductor companies, quoted ABB’s Asia-Pacific hub digital head Martin Hogberg as saying that technologies in Industry 4.0 would generate value of US$4 trillion to US$11 trillion by 2025. “Based on our experience, we see Industry 4.0 as likely to give companies a 200% or more increase in productivity while delivering a 30% reduction in overall energy cost. At the same time, it will deliver products that are likely to last up to 30% longer,” he was reported as said. But a dearth of enthusiasm to catch up with global trends among local players due to lack of information, resources and, in some cases, downright ignorance could be hindering the adoption of Industry 4.0. ViTrox Corp Bhd CEO and president Chu Jenn Weng says the industry is slow in terms of moving up the value chain, owing to resistance to a mindset shift among SMEs as most are family-run businesses as well as a lack of funds, expertise and talent. “The whole world is moving towards Industry 4.0, automation is one of the key enabler technologies, but Industry 4.0 is not just about automation ... automation is Industry 3.0,” he explains. To prepare SMEs for the transition, ViTrox, Pentamaster Corp Bhd and Walta Engineering Sdn Bhd are setting up a one-stop metal component supply chain hub featuring 18 SMEs that will cater for Penang-based MNCs and LLCs. The hub, called the Penang Automation Cluster, is expected to generate RM980 million in revenue for LLCs by 2021 while the spillover effect on SMEs under the cluster is estimated to be more than RM118 million. Penang Automation Cluster is the first SME precision metal fabrication or automation cluster in Malaysia that will support and enhance the development of the existing supply chain ecosystem of industries and services in Penang. These are primarily those in the semiconductor, E&E, medical device, light-emitting diode and avionic segments. 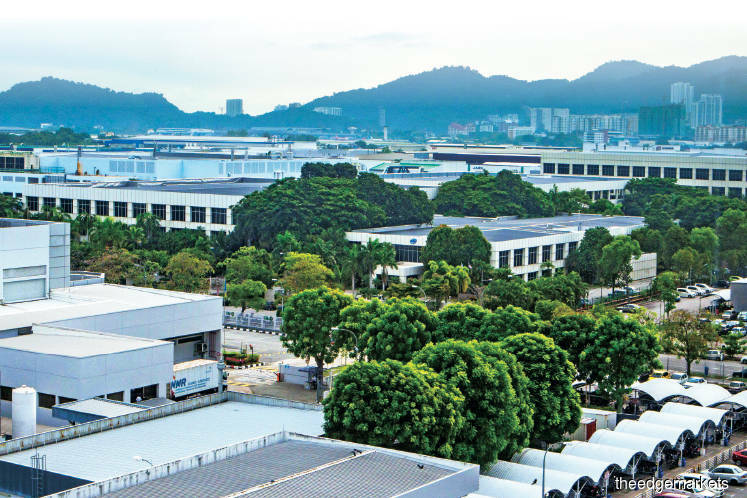 In February, Penang Automation Cluster Sdn Bhd (PACSB), the company set up by the three companies, bought 2.04ha in Batu Kawan Industrial Park for RM3.52 million or RM16 psf from the Penang Development Corporation. ViTrox and Pentamaster own 35% each in the company while Walta Engineering holds the remaining 30%. Following approvals from the Department of Environment, Penang Automation Cluster will carry out activities such as precision engineering and sheet metal fabrication, tooling, machining, finishing and coating services. For Chu, elevating Penang SMEs to a standard on a par with countries like Taiwan, which has a similar trade history, is crucial in order to sustain the robust industrial evolution. “As far as ViTrox is concerned, we started the automation cluster this year. Fabricated parts are very important components of automation,” he says. He says PACSB has submitted proposals to the federal government for support to grow faster. “We need support from the government, be it state or federal. The state offered the land at a reasonable price of RM16 psf. We are still at the planning stage on how to build the 18 factories [but] we plan to complete them in early 2019. “We are one of the solution providers in moving up the value chain. In the Malaysian context, it is shifting from labour-intensive to automation. We are replacing operators with machines in the area of quality control. “In the semiconductor industry, about 10 years ago, every component had to be inspected by an operator, one by one, to check for defects. But now, with the fully automated machine, the vision is incorporated into the machine to check 100% the dimension and finishing of the components,” he says. He says the federal government has been very helpful in giving ViTrox pioneer status and tax incentives, but the industry hopes for more for SMEs. “The government should give more assistance to more SMEs. After all, they are very important in the supply chain; they can form a strong ecosystem in Malaysia. We cannot just focus on attracting foreign direct investment. “FDI is important, but we have to give equal attention to SMEs. SMEs are here to stay because they will grow the economy. MNCs may exit the country and move their plants to other countries,” Chu explains. Meanwhile, SME Association of Malaysia (Samenta) honorary secretary Yeoh Seng Hooi says it is “nice to talk about robotics or artificial intelligence”, but SMEs tend to return to basics, namely hiring workers because automation is capital-intensive in nature. “Not many have adopted software integration due to mindset and fundraising challenges, but the younger generation of SME companies are more information technology savvy and are willing to move but need help in the form of incentives,” he says. Nonetheless, he says the phenomenon affects only certain sectors as several companies in the E&E sector have grown as a result of their relationship with MNCs that push them to improve their performance. Invest-in-Penang’s Loo says the Industry 4.0 culture will develop with German companies Osram, Bosch and Braun, which have been in the state for more than 40 years. “They would want to grow their 4.0 here too and develop their strengths because it benefits them. It will happen through procurement processes where knowledge will be passed on,” she says. However, Loo says front-end manufacturing, such as wafer fabrication and IC design, needs more capital, higher level engineering education and talent, in which Malaysia would have to catch up. “We are moving up the value chain in terms of technology adoption [but] not so much into front-end [manufacturing] because it involves high investment, re-investment, and reskilling. But it must be noted that a number of local organisations are manufacturing higher-end products,” she says. She notes that Penang still attracts investors due to its strong ecosystem — an established sector that supports MNCs and a pro-business government that ensures speed in execution. She says the industry is bullish about growth in the next 12 months to two years, which will lift supporting industries in the state. He says this is an opportunity for SMEs in the food, garment and rubber glove sectors to consider in order to modernise instead of doing business the traditional way. At this point, it can be concluded that while those in the automotive, medical device and smartphone supply chains appear to have moved along with their customers towards automation and digitalisation, there are some in other sectors that are slow to adopt new technologies. And so, the question remains whether the rest can play catch-up and how long this would take.